In the aftermath of the Browns trading Trent Richardson, who less than two years ago was the 3rd overall pick in the NFL draft, there has been much talk about whether the running back position is dead. Don’t believe the hype. Running backs matter. Here’s why. Hit the title/read more to continue reading. . . The first argument advanced involves the draft itself. Last year, no running backs were selected in the 1st round. Richardson, a top 5 pick, was traded for a 1st rounder from the Colts that figures to be somewhere between 15 and 25 next year. With their draft stock falling, that must mean the position isn’t of any value, right? Wrong. For years, NFL teams ignored middle linebackers, centers and safeties until the later rounds of the draft. Then one day someone noticed that having an all-world center was better than having a borderline starter-quality tackle, and centers suddenly started going earlier. Someone else noticed that players like Brian Urlacher and Ray Lewis could transform an entire defense. Suddenly, middle linebackers were valuable. Same thing for safeties. Positions in the draft rise and fall in the relative scheme of things. Right now, there is no reason to go top 5 for a running back because you can get an excellent one late in the first, in the second, or even in the bottom four rounds. That doesn’t mean they don’t have value on the field. The second argument involves the evolution of the NFL into a passing league. And yes, you must have a potent aerial game to win in the league. But running backs still serve multiple valuable functions. The prototype NFL backs of the past like Jim Brown and Franco Harris were power backs who ran the ball up the middle. Fast forward a bit and you had Roger Craig and Thurman Thomas who could run and catch. Fast forward just a bit more. Today’s elite backs are mostly multiple threat players like Ray Rice and LeSean McCoy. They can run with speed, agility and power. They can catch the ball out of the backfield, or they can line up wide and run wide receiver routes. They can pick up blitzes and block. That’s not valuable? Don’t make me laugh. 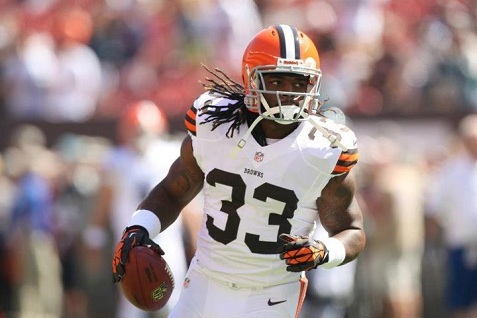 It is true that a player like Trent Richardson couldn’t turn around a crap offense like Clevelands. Those days have truly gone. Teams with bad quarterbacks can have elite running backs and will still struggle. Maurice Jones-Drew couldn’t fix Jacksonville and Jamal Charles couldn’t fix Kansas City. But you can certainly have a running back be your best offensive player and win. Baltimore’s best offensive player is obviously Ray Rice. They just won a Super Bowl. Put a half-decent defense in Philadelphia, and maybe they would get to one too with LeSean McCoy. But what about the teams that win without any kind of decent running back. Yeah, let’s take a look at that. The Colts won a Super Bowl with Joseph Addai. They had Peyton Manning. It is true that if you have Peyton Manning, Tom Brady, Drew Brees or Aaron Rodgers, you can win without a good running back. Those are the four best quarterbacks in the NFL, and honestly, they are head and shoulders above everyone else. And those guys benefit from having at least the threat of a running game. Which brings us back to Richardson. He wasn’t going to win in Cleveland with that offense, and they were probably smart to trade while his value was high. They want to completely remake their offense. And as we’ve pointed out, you can get a good running back in the later rounds. They’ve got Andrew Luck, they’ve got Reggie Wayne, they’ve got Coby Fleener. What was missing was a back who could make defenses pay for taking away Luck’s weapons on the outside and over the middle. Trent Richardson is unlikely to see a lot of 8 in the box defenses like he saw in Cleveland. He will probably go off as part of the Colts offense, more than once, over the course of this season. Call this one a trade that made sense for both teams.